Strong thought provoking new material from W.A.S.P. Having always having been a ‘follower’ and self proclaimed ‘preacher’ of all things WASP and Blackie Lawless, I was eagerly awaiting their latest release. The odds were that the next release was the long awaited DVD and live album of ‘The Crimson Idol’ Tour (we have only waited 15 years). But lo and behold, this was not to be. 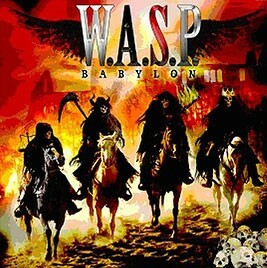 Instead we have ‘Babylon’ with its Four Horsemen Of The Apocalypse adorning the album cover. With its obvious religious and political undertones, ‘Babylon’ is the latest installment in the ongoing WASP saga and follows in the footsteps of the topical and often controversial subjects that Blackie counts dear to his heart. This is certainly no follow on from any of W.A.S.P’s previous concept albums ‘The Crimson Idol’ or ‘Neon God’; it’s a reflection of Blackie’s view of our current times, just as he explored with ‘Still Not Black Enough’ and ‘Dying For The World’. Once again, musically, the band keep with the heavier sound that has become their trademark ever since ‘The Crimson Idol’, which reflects the seriousness and subject matter of the album on various levels. There is a certain amount of darkness within the guitar riffs that is further enhanced by galloping rhythms (four horsemen will ride! ), elevated melodies and the sheer class of Doug Blair’s guitar solos throughout. The only exceptions to the above are the melancholic ballads ‘Godless Road’; with its realization of life, the reflections and the sense of finality, and the impassioned ‘Into The Fire’. Opening with ‘Crazy’, so radio friendly it should definitely be released as a single [which it just has – Ed] with its great chorus, driving beat and roaring guitars. On top of this I guess any die-hard WASP fans listening to this would think it was directed at them. ‘Babylon’s Burning’, with its direct quotations from The Bible’s ‘Book of Revelations’, is evidence that Blackie has been doing his theological research, which along with his well documented political views, is the album’s centerpiece. A glance at the album’s track listing gives the appearance that W.A.S.P have found religion, but look deeper into the insightful lyrics and the religious iconography and you will see that it is also a critical observation of the world that we live in today; global decline both politically and socially. The lyrics hint at the depth of Blackie Lawless’ thoughts and views. Despite the seemingly serious nature of the album, W.A.S.P are still at heart a great hard rock band, fans as well as performers, and so lighten the load with a blistering version of Deep Purple’s ‘Burn’ and in a tongue in cheek homage to the King, a faithful cover of Chuck Berry’s ‘Promised Land’ with Blackie taking on an Elvis persona all the way down to the southern drawl. At the end of the day I am a W.A.S.P. fan and was more than likely going to love this album, BUT… beyond the image most people have of W.A.S.P. and in particular Blackie Lawless, this album again shows a side of him beyond cod pieces, blood and naked women. It is not only a very fine rock album but also proof that intelligence and heavy metal can mix.